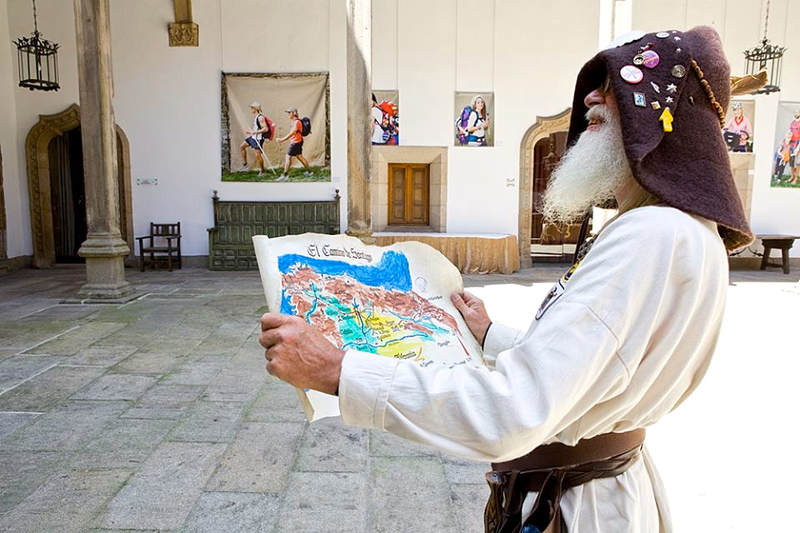 German and I had two fantastic days in the Parador Santiago de Compostela capturing the faces and stories of the pilgrims’ as they arrived Km 0 Santiago, during the Rexistro 108 Vilei Exhibition in the Cloister San Marcos. It was very special to meet more of the pilgrims’ and hear their stories. Thomas from Munich Germany has been making the Camino for 7 years. The Camino journey is a tradition for Thomas as he sets out for 2 months each year on a new adventure of discovery. Very inspiring – we look forward to sharing more of Thomas’ and other pilgrims’ CAMINO travels soon. This entry was posted in Camino Inspirations!, Camino Stories & Syncronicities and tagged camino, culture, exhibitions, history, Inspiration, nature, The Way, traditions. Bookmark the permalink.